In his first regular column, Strange Cinema author Mike Vaughn reviews Halloween themed anthology 10/31 and chats with its director. When it comes to strange cinema, I literally wrote the book on it. 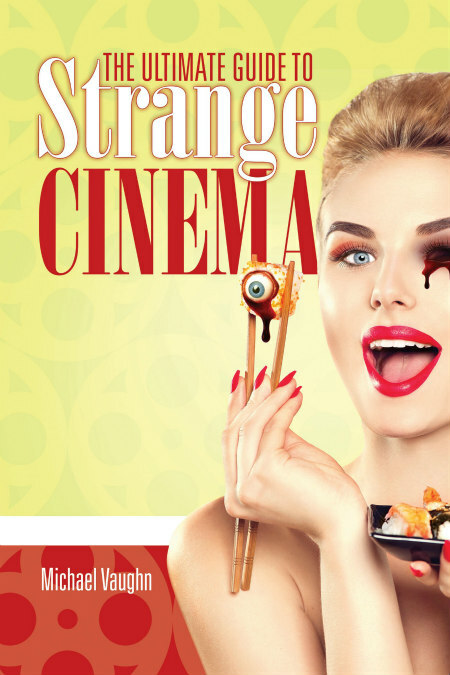 My name is Michael Vaughn, author of 'The Ultimate Guide to Strange Cinema'. The good folks at The Movie Waffler were good enough to give me my very own padded cell where I can bring you the weird, the wild and strange. Seeing how it’s halfway to Halloween I was able to unearth a much hyped indie film, 10/31. If that weren’t spooktastic enough, writer/director Zane Hershberger sat down with me to give TMW an exclusive interview. It's not hard to see why Halloween is every horror fan's favourite howl-a-day. So when buzz was going around about a horror anthology in the same vein as Trick ‘r Treat I was foaming at the mouth to sink my teeth into it. Framed by a horror hostess, 10/31 showcases six spooky segments set on, you guessed it, Halloween. The Old Hag: Two filmmakers - Tyler (Nickolaus Joshua) and Kevin (Mitchell Musolino) - find a job filming a B&B commercial inside a beautiful but creepy mansion. Little do they know an old hag is lurking within. 'The Old Hag' kicks off this film and it does a nice job at setting up a fun, spooky vibe that carries through the film. The direction is solid and the camera work by Zane Hershberger is just slightly off kilter, giving everything a creepy and foreboding feeling throughout. Story wise it's pretty good, albeit a few not so great bits of dialogue. Overall 'Hag' is a good starter story and it nicely pays off the set up. Trespassers: After leaving a crappy horror movie, local girl Stephanie (Sable Griedel) takes a date to soak up some gruesome local history to spice up her Halloween date; however, she gets more than she bargained for. Growing up in the country, I love rural based horror and 'Trespassers' taps into that, and I dug how 10/31 went there. Story wise it's good, although I felt like the ending while good, still could have used some work. The makeup effects are on point considering the modest budget, and the gore is extremely well done. Matt Cannon composes a great score that perfectly fits the mood, giving the segment a more polished, put together feel. Overall a fun segment and a follow up to 'Old Hag'. Killing the Dance: Despite her mother’s wishes, a rebellious girl named Ashley (Bailey Ingersoll) and her little brother go to a roller rink on Halloween. Ashley thinks she is going to skate the night away but realises a killer with a straight razor is among them. Director Johnny Holt does a great job at visually making this an interesting segment, choked full of atmosphere with the lighting, camera work and smoke machine giving it an almost hypnotic feeling. While it’s not exactly set in the '80s, Holt really nails the vibe of that time period without going overboard. As with the other two segments the set up is well paid off by the end, this time with a nice twist. The Halloween Blizzard of '91: As the title suggests, a horrible blizzard comes through on Halloween night cancelling the beloved holiday. However the snow also brings somebody fat but not so jolly. Now it's up to Old St. Nick to bring out the true reason for the season. 'Blizzard' has the seed of a great idea, namely melding Christmas and Halloween, something not seen since the Tim Burton produced The Nightmare Before Christmas. But as so oft happens, a good idea is only as good as how it's executed and sadly the idea is not taken far enough to be interesting or compelling. Visually the film is solid with nice camera work and decent gore effects that will be sure to please any gore hound. Overall though, not as good as it could have been. The Samhain Slasher: Probably the weakest of the segments, 'Samhain Slasher' lacks a lot in the story department, and while some of the other segments had a few writing missteps they at least felt like they were trying to produce something interesting or different. 'Slasher' felt like a basic slice and dice, which is fine but it left me wanting more. Still, if you just want some mindless gore you’ll be plenty satisfied with this gore soaked outing. Like the previous segments, the gore effects are on point considering the budget the filmmakers had to work with. End segment and overall thoughts: Horror hostess Malvolia: The Queen of Screams (Jennifer Nangle) sends us out in wonderfully macabre style and the last moments of 10/31 are a pure gore soaked Halloween treat. 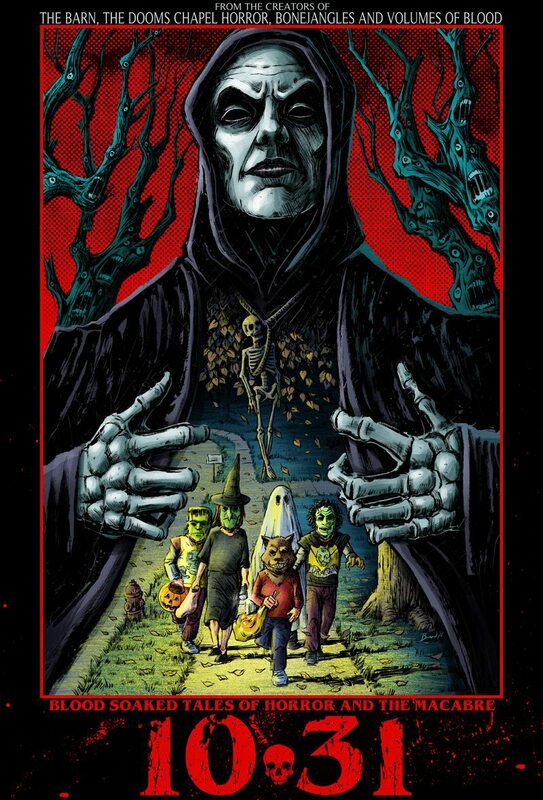 Overall 10/31 is rough around the cauldron but that doesn’t make it a bad movie by any means, because if you allow yourself to gloss over some of the flaws you will find a great little seasonal gem that is entertaining, perfect for anytime viewing or your next Halloween gathering. I for one can see making this a part of my annual Halloween viewing. Well worth checking out! And as promised, a little bonus treat for you readers. I had the rare treat to talk to writer, director and DP Zane Hershberger, who shared some insights into his role in this soon to be cult classic. MV: How did you get involved with this project? ZH: I got involved by just talking to Rocky about the project whenever he told me he was going to attempt to do an anthology of his own. I was reading two of his scripts he already had penned and asked what other ones he was doing. He told me he had some ideas, but nothing was concrete and I asked if I could take a stab at writing one. Then it kind of snowballed from there to where I ended up writing and directing my segment. MV: You not only directed 'Trespassers' but shot 'Old Hag'; was it always the plan that you`d DP 'Hag' in addition to directing 'Trespassers'? ZH: Yes, after shooting The Barn, Justin Seaman and I forged a strong filmmaking relationship that continues to this day and I usually film everything he directs. MV: How long did 'Trespassers' take to shoot? ZH: Well, we first started shooting in May I believe, weekends only, and continued on through the summer until about the beginning of August. We were also shooting part of another anthology, during the same summer, that we are presently working on called Cryptids. MV: The effects are great; would you say most of the budget went to that aspect of the production? ZH: Absolutely, almost my entire budget went to the FX, props, and wardrobe for the characters. The FX were provided by Robert Kuhn and his wife, Sarah. MV: What were the challenges of that production? ZH: Shooting in May, we had to contend with some rainy weather. In fact, the first night we shot with Sable Griedel and Chad Bruns inside the car, as they were driving - it rained. We had to pull the car inside the barn on the property and try some different techniques to make it look like the car was in motion - classic, on a sound stage type stuff. The other major issue was, Freedom Road runs right beside the property and is a decently traversed road, so audio contamination from passing vehicles was definitely a hurdle. We sat there for an hour on one night trying to get one sentence recorded without issue! Another evening, five police officers arrived because they received a call about our scarecrow hanging up on the property. Somebody saw it from the road and reported a “Body hanging on a cross.” The one officer said that area wasn’t even his jurisdiction; he just thought it sounded interesting and came out to see what was going on. MV: Did you keep any mementos from the shoot? ZH: I gave the scarecrow head to the actor who played him, Jed Giacchino, and the skull that comes into play later in the segment went to Rocky Gray…and so did the fake axes. I have a pile of bloody clothing and wigs. MV: What is your favorite Halloween based horror film (besides 10/31)? ZH: Hands down…Night of the Demons. MV: What are you working on currently? ZH: We are currently working on a monster themed anthology called Cryptids, and I have been working as crew on a martial arts/zombie film called Johnny Z.